COPELAND Council has warmly welcomed five new apprentices to the organisation. The council's thriving apprenticeship programme has employed people in the departments of Environmental Health, Economic Development, Open Spaces, and Revenues and Benefits. 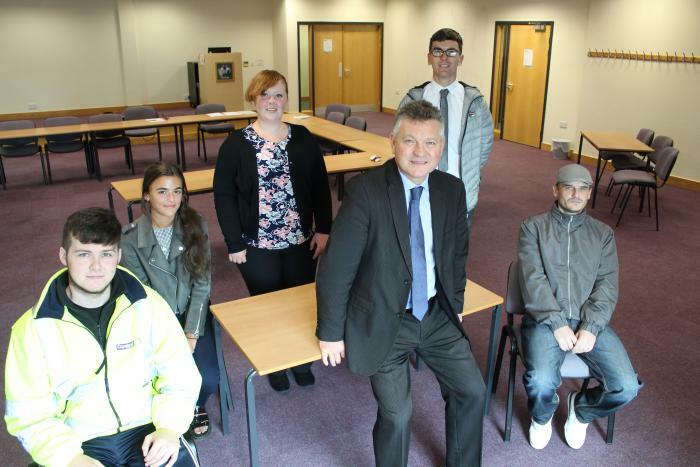 Mayor Mike Starkie said: "It's great to welcome another cohort of apprentices to our work family. Last year's intake have added immeasurably to our skills base and having met these new staff I am sure they will do just the same. The apprentices will learn the skills needed for specific roles, and study for academic qualifications along the way. The apprenticeships last from 18 months to three years and it is hoped they will lead to permanent jobs within the council. We welcome Reece Crickett and Kevin Murray in Open Spaces, Andrew Sinclair in Revenues and Benefits, Maya McGrady in Community Support and Leah Scott in Environmental Health. Mayor Starkie added: "Apprenticeships like this are an incredible opportunity for us as a workforce. Employment and skills is one of our priorities. This scheme means we can make sure we have the skills we need whilst providing good jobs and training for local people." The apprentices will work with Lakes College, Newton Rigg and Gen2 to gain qualifications of NVQ levels 2-4 as they complete their apprenticeships. The scheme has been supported by Inspira (interview support preparation), Citizens Advice (money management training) and Lakes College (customer service/communications training). The training element of the Copeland Apprenticeship Programme is funded by the National Apprentice Levy.